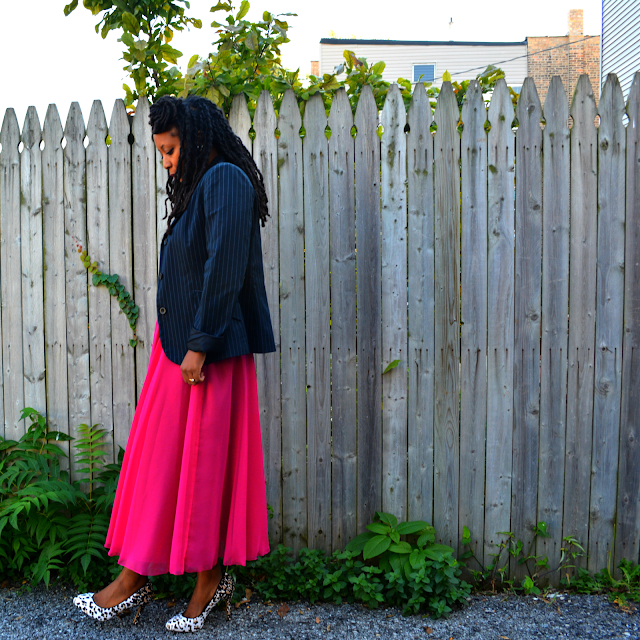 I found this hot pink chiffon skirt at an estate sale. The owner had several of the same skirt in all colors (she had several duplicate items and most with the tag still on). While I understand wanting a great fitting garment in different colors, I wondered why she needed so many of this somewhat basic skirt. I tried it on and squealed over its twirlability and the swish-swish sound it made when I walk. Now I know why she had so many. 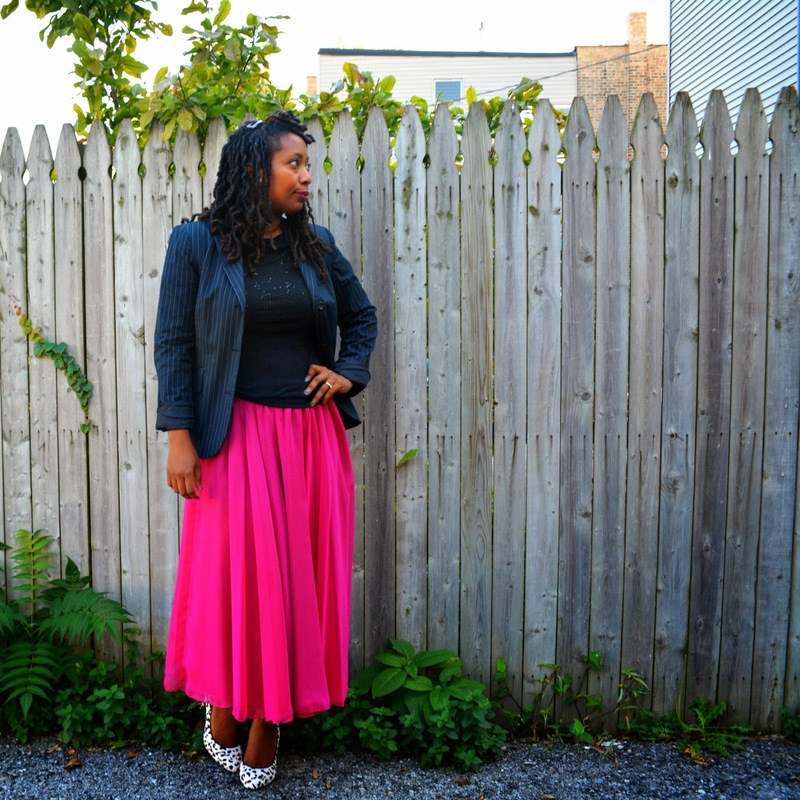 This skirt is like wearing a party. All bright colors and fun with an extra special bonus of having an elastic waist! Since chiffon is queen of the one time wear fabrics, they are easy enough to find in thrift stores. Bridesmaid skirts, mama of the bride skirts, that black-tie event skirt all eventually end up donated after a good seasoning in the back of the closet. Don't bother looking for your size on the label. You won't find one if the skirt was custom made or it can be completely off. Just eyeball and try on. This skirt is labeled XL. It's vintage. This is what XL vintage looks like. Examine carefully for pulled threads or tiny holes. It's easy to snag this delicate fabric. Consider additional cost of dry cleaning. Even though mine is 100% polyester it is dry clean only. I'm probably going to ignore this in the future and put in in the washing machine but do as a I say, not as a I do. If you spot the mini skirt with the long hi-low hem chiffon overskirt. Think carefully before purchasing. Are you going to like it in the morning? Pair with edgy clothing and accessories like leather or studs to tone down the special occasion vibe of chiffon. 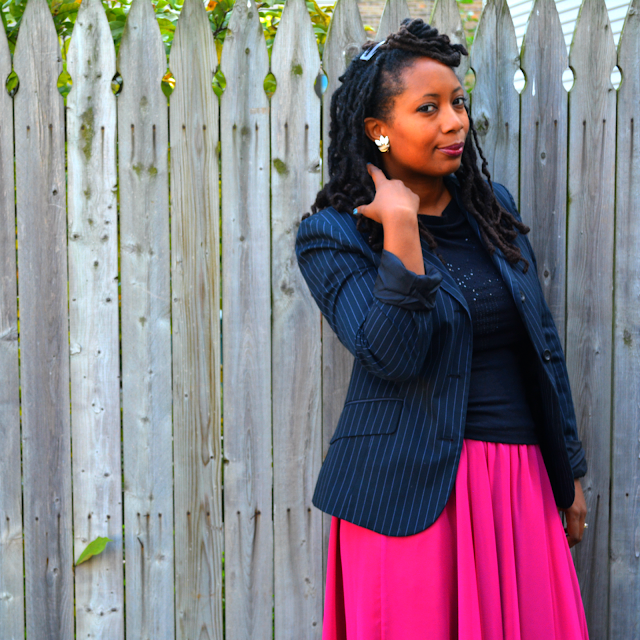 As you can see I stuck with black but I used a variety of prints and textures to add more interest to the hot pink skirt. Totally unnecessary, but I wanted to go a step above basic. Color block a brightly colored chiffon skirt with an equally bright top and wear a neutral colored shoe. If your skirt is tea length, wear those tall heels. It's an odd length for flats. 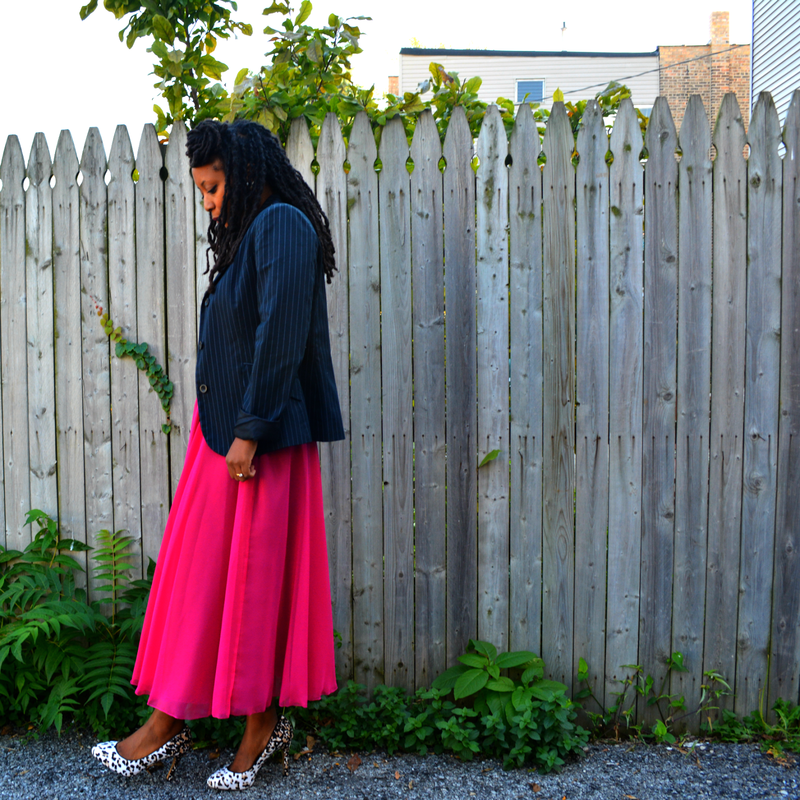 Visit my Chiffon Skirts Pinterest board for more inspiration and style options. How much chiffon is in your closet? I love the length on you! It shows your pretty shoes. I agree 100% with your tips and tricks. 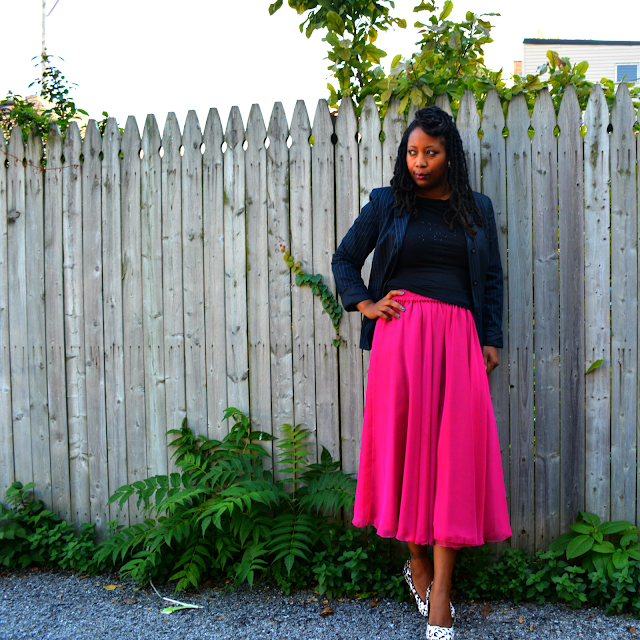 I only own one chiffon skirt but now I want more! What a gorgeous color and those pumps are too fun! 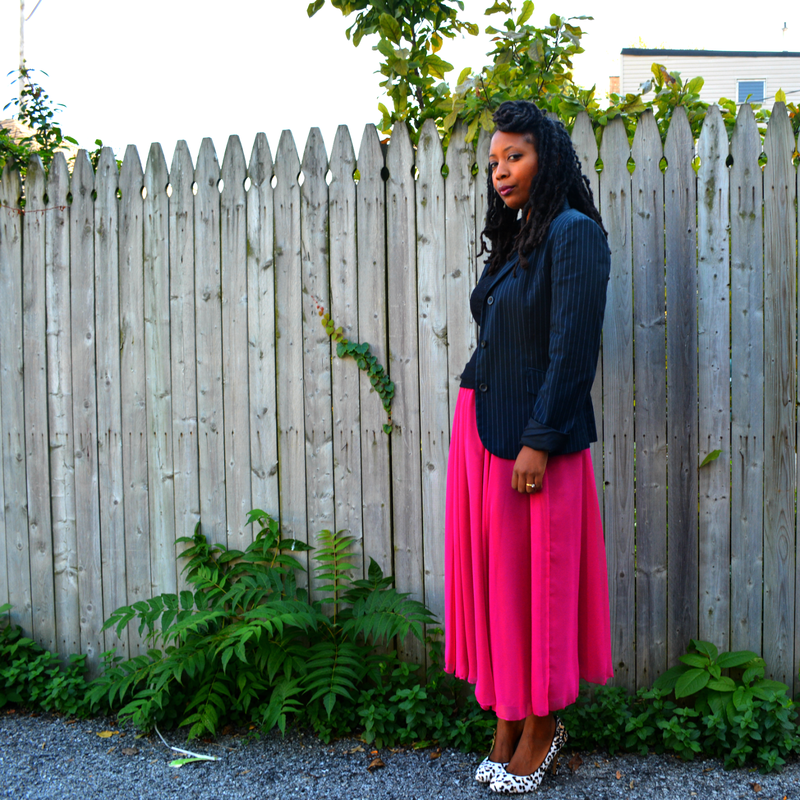 I don't know if I own any chiffon...hmmm....I really like that bright pink on you, and the blazer you paired with it! Such a fun color! I love your shoes too. Awesome find!! I know what you mean about the swishyness. It makes you smile just by walking. Great colour and you have styled it magnificently - as always! !